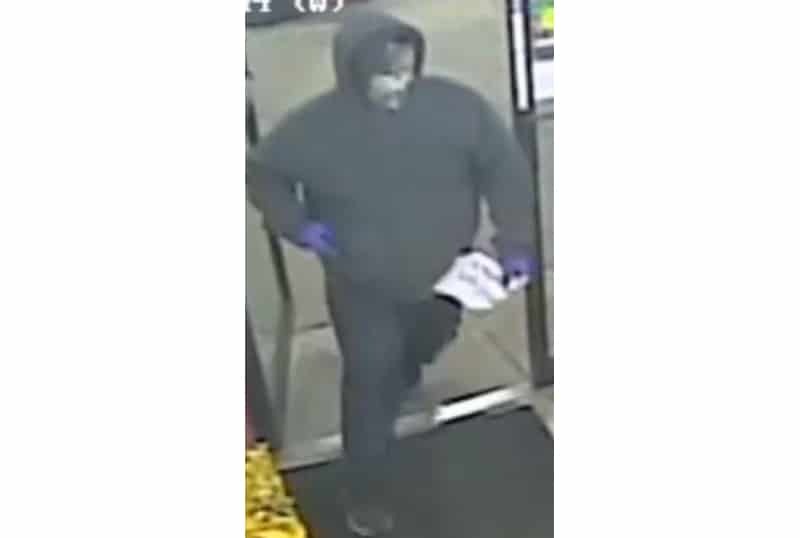 Police are searching for a man who robbed a Phillips 66 gas station in Fox Lake at knifepoint on Friday and fled the scene with cash. The Fox Lake Police Department said that at 4:40 a.m. a robber walked into the Phillips 66 gas station at 20 North Route 12 and gave a note to the clerk demanding money. The suspect threatened the clerk with the knife and fled the scene on foot with a small amount of cash. The armed robber is described as a heavy set white man between 20 to 30 years old and 5-foot-9. He was wearing a camouflage scarf over his mouth and nose and had surgical tape cut into strips outlining his eyes, police said. He was also wearing a gray fleece hooded sweatshirt and blue or green cargo-style pants. Police said the suspect fled on foot southbound from the scene. Authorities are asking for the public’s help in identifying the suspect. Anyone with information is asked to contact the Fox Lake Police Department at 847-587-3100.